"A Form that handles both the Keyblade and magic." Master Form is a Drive Form that handles both the Keyblade and magic which appears in Kingdom Hearts II. It uses both of your party members, and consumes four of Sora's Drive Bars. It represents the fusion of Valor Form and Wisdom Form, and is obtained when Sora reunites with King Mickey at Hollow Bastion. Its emblem is a yellow saltire. Master Form is a balanced Drive Form that allows Sora to wield two Keyblades, one by hand and the other controlled through telekinesis. It is proficient in both melee combat and magic. 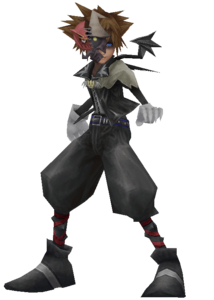 This form's fighting style is primarily aerial based since all attacks, both physical combos and offensive magic, raise Sora into the air, which means the form has no ground attacks whatsoever. Physical attacks are fast and powerful finishers provide crowd controls effects, such as stun and magnet. Magic is also modified, as combos can be strung forever, disabling magic finishers, and most spells are empowered or altered. In terms of mobility, Sora runs faster than his normal speed and can double jump using his Growth Ability. Master Form gains experience by collecting Drive Orbs; one point for each small orb and three points for each large orb. Levelling up upgrades the form's Growth Ability, Aerial Dodge, for both itself and Sora's standard form. Leveling up Master Form also grants Auto Master and two Air Combo Plus abilities to Sora's standard form. Master Strike Lv1 Unleashes a powerful finishing combo move that successively attacks a single target. Master Magic Lv1 Powers up magic. Disaster Lv1 Unleashes a powerful finishing combo move that draws in several enemies and successively deals damage. Auto Master Lv2 (Standard) Automatically sets the Reaction Command to Master in a pinch, if Master Form is usable. Lv3 (Standard) Press in midair to jump again. It is useful for dodging enemy attacks. Lv5 (Standard) Press in midair to jump again. It is useful for dodging enemy attacks. Lv7 (Standard) Press in midair to jump again. It is useful for dodging enemy attacks. Aerial Dodge MAX Lv7 Press in midair to jump again. It is useful for dodging enemy attacks. Synch Blade Lv1 Equips a Keyblade in each hand. The ability of the left hand weapon becomes available as well. Endless Magic Lv1 Unleashes magic combos endlessly. Lv6 (Standard) Increases maximum combo by 1 when in midair. Equip more to enable more combos. Draw Lv1 Draws in and obtains nearby orbs. Equip 2 to obtain far orbs. MP Hastera Lv1 Greatly increases MP restoration speed after MP is fully consumed. With its aerial fighting style, Master Form is especially useful against airborne enemies. Equipping Hero's Crest as the form's secondary Keyblade is a solid choice due to its Air Combo Boost ability. Its Disaster finisher is an excellent crowd control attack with its ability to draw in enemies. With its Master Magic ability, Sora is much more mobile when casting offensive magic, allowing for good hit-and-run tactics. Since Master Form levels by collecting drive orbs, try and fight enemies that drop lots of orbs and can be defeated quickly. Gamblers can also be a good choice to battle if you have the Drive Converter ability, just continuously use the Stop Dice and Begin Game Reaction Commands to obtain quick drive orbs while in Master Form. The best Keyblades for training Master Form are the more balanced: Oathkeeper, Bond of Flame, and Ultima Weapon. Hollow Bastion is a great place to train, as well as the Land of Dragons, as the explosives drop drive orbs as well. Crimson Jazzes and Morning Stars in particular are good prey. It's wise to avoid using Master Form against bosses, and instead use Valor Form which can be leveled up in the fight. In Kingdom Hearts II Final Mix, the balloons within the Cavern of Remembrance drop Drive Orbs when attacked. A good Keyblade to use while in Master Form is the Sweet Memories Keyblade, as its ability changes all munny drops into Drive Orbs. When using Master Form for proper combat, it is best to equip balanced Keyblades. 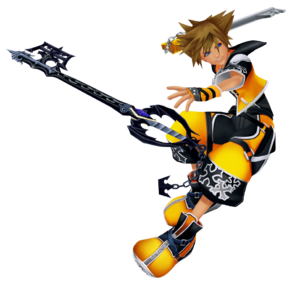 The Fatal Crest Keyblade allows Master Form to engage in endless combos due to its Berserk Charge ability; combined with Master Form's innate Endless Magic ability, Sora becomes able to attack enemies without pause until the Form gauge depletes. ↑ Yen Sid's mirror: "An image of you possessing all abilities flows into your mind."